Everest Poker is a multi-national, multi-lingual poker destination that is dedicated to bring poker enthusiasts from all over the world together for an exciting global gaming experience. They have translated their software into many languages and more will be added over the coming months. They care a lot about their reputation, so they work hard to earn the trust, respect and loyalty of every player who visits the Everest Poker room. The rake structure at Everest Poker is absolutely generous! Besides that, they don't charge rake if a hand ends before the flop, and the rake is capped at $3. An average poker player should be able to gain some profit, while an experienced poker player will have an easy catch at the Everest Poker tables. Frequent players at Everest Poker are rewarded with Summit Points, which can be redeemed for entries in real poker tournaments, Everest Merchandise, and you will also have the option to play at their points-for-points tables and tournaments. Next to the great bonus and loyalty program, Everest Poker is a huge offline promoter as well. You can qualify online to earn your way into tournaments like the World Poker Tour (WPT) and the World Series of Poker. Buy-ins start as low as $1.20. In the following part of our Everest Poker review you can read in-depth information about Everest Poker's client, website, security & integrity, traffic & games, bonuses & promotions and support. Grand Virtual is the name of the company behind the Everest Poker application. Over the years they have managed to develop a sophisticated poker room, favorite to many frequent poker players. The 3D graphics are catchy, but not stunning. Let's just say that they have a different approach than most other online poker rooms. Simplicity is the synonym for finding a game at Everest Poker. The intuitive lobby includes a convenient "find-a-seat" wizard, which will help you easily locate a game that fits your personal level. Also nice is the "fold & show" feature where you can show your folded hand to your opponents. Beginners in general will definitely love the interactive poker tutorial, which will guide you through the game of poker in steps. 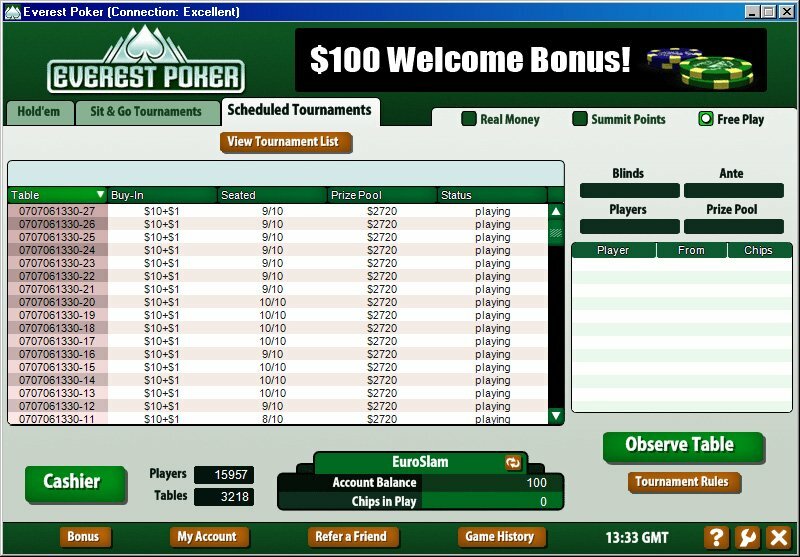 Everest Poker is available in the following languages: English, French, Japanese, German, Italian, Portuguese, Norwegian, Dutch, Polish, Finish, Danish, Swedish, Spanish, Hungarian, and Greek. That's quite a lot of different languages, isn't it! Signing-up at Everest Poker through one of our links together with bonus code PFF300 will give you an improved welcome bonus of $300. The bonus at Everest Poker is not a match bonus, but a claim bonus and you will get it independently of the height of your first deposit. The incremental bonus clears in pieces of $0.07 for every Summit Point you'll earn. Each time you'll end a cash game session or poker tournament/sit & go, the cleared bonus money will be added to your poker account. Their membership of the Online Gaming Alliance, which is formed to establish standards for operational excellence and ethical business practices in the online gaming industry, provides players with assurances of fair play, security and trust. They are strongly committed to absolute fairness, protection and security of their loyal players. Everest Poker maintains a zero tolerance policy for players attempting to cheat, or gain any other kind of unfair advantage over other players in their online poker client. They have enhanced programs to analyze table actions and logs to detect cheating, fraud, and collusion attempts. The game variety is very limited, as they only offer Texas Hold'em poker, but this doesn't mean that it keeps the players away. 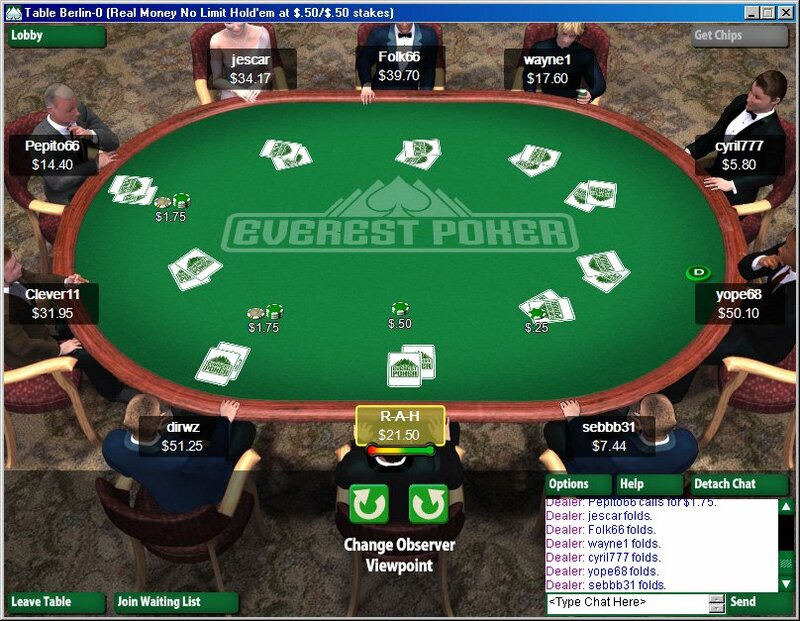 Everest Poker is a favorite to many online poker players, just because of their different approach. Everest Poker offers the option to find a solution to a problem in the Frequently Asked Questions section on their website. If you're still having problem, then they have a form on their website to contact customer support. We have tested this, and the results were great. We've received an answer to our question almost instantly. We do regret that there's no way to contact support besides the previously mentioned options.